Hafnium is an element that chemists knew existed, but could not find. They knew it must exist because of an empty space in the periodic table. The periodic table is a chart that shows how chemical elements are related to each other. By the twentieth century, nearly all the spaces in the periodic table had been filled. One of the empty spaces was element 72. A number of chemists searched for the element. Some even claimed they had found it. But these claims were not confirmed. In fact, it was not until 1923 that element number 72 was finally discovered. Hafnium is a shiny, silvery-white metal. It is always found with another chemical element, zirconium. The two elements are very much alike. In fact, their similarity is the reason that it took so long to find hafnium. Hafnium has only a few applications. Probably its most important use is in nuclear power plants. A nuclear power plant is a facility where energy released from nuclear fission reactions is used to generate electricity. A stream of electrons is fired at a metal plate. The electrons can cause the metal plate to give off X rays. This is a simple explanation of what happens when a person has a chest X ray or an X ray of a broken bone. The kind of X ray produced depends on the metal used. Each metal produces its own special X-ray pattern. 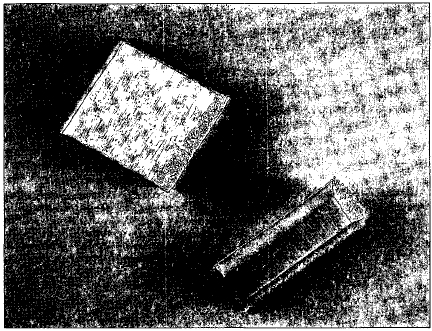 In fact, the pattern produced can be used to identify a metal. In 1923 Dutch physicist Dirk Coster (1889-1950) and Hungarian chemist George Charles de Hevesy (1889-1966) found element 72 by X-ray analysis. The element was present in a piece of Norwegian zircon. Zircon also contains the mineral zirconium. Chemists later developed a better understanding about the relationship of zirconium and hafnium. These two elements are as alike as any two elements in the periodic table. They have nearly identical chemical and physical properties. This explains why it took so long to find hafnium. Chemists had probably discovered hafnium before 1923, but thought it was zirconium. The differences in the X-ray patterns of the two elements finally proved that hafnium was different from zirconium. Hafnium is a bright, silvery-gray metal that is very ductile. Ductile means capable of being drawn into thin wires. Its melting point is about 2,150°C (3,900°F) and its boiling point about 5,400°C (9,700°F). Its density is 13.1 grams per cubic centimeter. The physical property of greatest interest for hafnium is how it responds to neutrons. 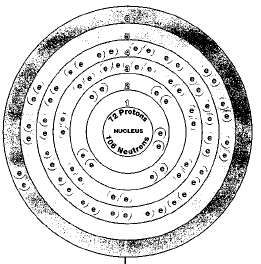 A neutron is a very small particle found in the nucleus (center) of an atom. Neutrons are used to make nuclear fission reactions occur. Nuclear fission reactions take place when a neutron strikes a large atom, such as an atom of uranium. The neutron makes the atom break apart. In the process, a large amount of energy is released. That energy can be converted to electricity. neutrons must also be kept under close control. Hafnium has the ability to absorb ("soak up") neutrons very easily. It is used in rods that control how fast a fission reaction takes place. This property is one of the few ways in which hafnium differs from zirconium. While hafnium is very good at absorbing neutrons, zirconium hardly absorbs neutrons at all. Neutrons pass right through it. Both hafnium and zirconium are used in nuclear power plants. Like zirconium, hafnium is not very reactive. It does not combine easily with oxygen in the air or react with water or cold acids. It may be more active with hot acids, however. Hafnium and zirconium are as alike as any two elements in the periodic table. Hafnium is a moderately common element in the Earth's crust. Its abundance is estimated to be about 5 parts per million. That makes it about as abundant as bromine, uranium, or tin. Hafnium is used in nuclear power plants. 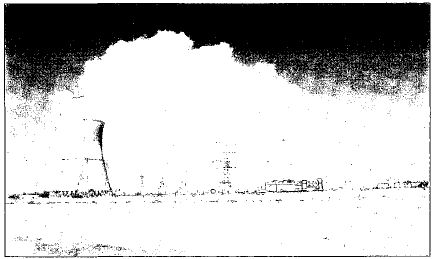 Pictured here is the Davis-Besse Nuclear Power Plant in Oak Harbor, Ohio. Hafnium is always found with ores of zirconium in the earth. The most common of those ores are zircon and baddeleyite. Hafnium has six naturally occurring isotopes: hafnium-174, hafnium-176, hafnium-177, hafnium-178, hafnium-179, and hafnium-180. The first of these is radioactive. It has a half life of an astounding two quadrillion years. (That's 2 followed by 15 zeroes!) Isotopes are two or more forms of an element. Isotopes differ from each other according to their mass number. The number written to the right of the element's name is the mass number. The mass number represents the number of protons plus neutrons in the nucleus of an atom of the element. The number of protons determines the element, but the number of neutrons in the atom of any one element can vary. Each variation is an isotope. Artificial radioactive isotopes can also be produced by firing very small particles at atoms. These particles stick in the atoms and make them radioactive. About 12 artificial radioactive isotopes of hafnium are known. There are no important commercial applications for any of these isotopes. The greatest problem in working with hafnium is finding a way to separate it from zirconium. Today, chemists know that compounds of hafnium dissolve more easily in some liquids than do compounds of zirconium. This method can be used to separate compounds of the two elements from each other. Nuclear power plant applications account for the largest use of hafnium metal. Hafnium is also used to make binary compounds with interesting properties. A binary compound consists of two elements. These compounds are among the best refractory materials known. A refractory material is one that can withstand very high temperatures. It reflects heat away from itself. Refractory materials are used to line the inside of high-temperature ovens. For example, some alloys are made at temperatures of thousands of degrees in refractory ovens. Some hafnium compounds used to line these furnaces are hafnium boride (HfB 2 ), hafnium nitride (HfN), and hafnium oxide (HfO 2 ). Nuclear power plant applications account for the largest use of hafnium metal. Both hafnium and its compounds are toxic. They are most dangerous when inhaled. Powdered hafnium metal is also dangerous. It can ignite and explode very easily.